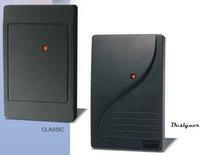 Wall switch sized prox reader. Dimensions: 4.7 in. x 3.0 in. x 0.68 in. (11.9 x 7.6 x 1.7 cm).